Improvement in Exports – 50% reduction in the trade gap between total exports and total imports for construction. Mr Wilson suggested in order to reach these targets the highways sector needs to start 'a different conversation, working together and taking the best ideas from other sectors'. care for the elderly and vulnerable in society by establishing a safety zone for vulnerable residents. 'Every day our people are thinking differently...Wires? Where we are going we don’t need wires,' Mr Wilson said. His team at Kier had grown dramatically over the last few years he said as the company sought to take advantage of new opportunities including Highways England's Innovation Fund. This had helped bring forward a range of new products including a solar powered wireless CCTV station requiring no groundwork, which he said was '£200,000 cheaper and quicker to implement’ and was used on SRN by Kier. Mr Wilson was joined at the conference by Kier’s executive director of highways, Dave Wright. 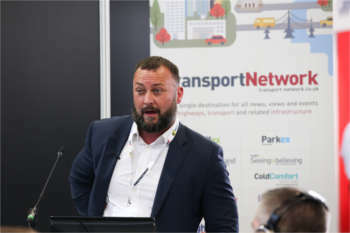 Mr Wright spoke to ITV, which covered the conference and exhibition, about the latest developments on the road network including the Mobile Barrier. This almost 18-tonne piece of kit was imported from the US and brought up to EU regulations by Kier. It acts as a physical protection vehicle, absorbing impacts from moving vehicles if struck from the side. A lorry-mounted crash ushion behind gives further protection from the rear and Chapter 8-compliant lighting and signage provides visibility. Also on safety, Kier introduced delegates to its smart worker system, which creates a demarcation zone around work sites and plant that the workforce cannot enter unless authorised to do so without setting off an alarm. The system is a practical digital application similar in principle to the Highways England passport system.